Signature Arts, Inc.: When The Good of the Hobby Needs to Come Before the Almighty Dollar!! When The Good of the Hobby Needs to Come Before the Almighty Dollar!! This duo, the RR Auction/Reznikoff gang is at it again. We have heard from several knowledgeable collectors and dealers complaining about the authenticity of items in the RR Auctions February 2010 sale from presidential signed items to sports celebrities signatures. We will focus on just one item in this story since the item is so well documented. It is a shame, even a disgrace, that some people still try to authenticate presidential autographs when they have failed at it so often and so miserably in the past. The latest Reznikoff/RR Auction mistake has been brought to our attention by a handful of collectors and dealers. 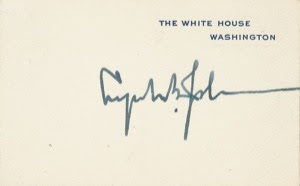 It is the Lyndon B. Johnson The White House card in the current RR Auction, item #79. We know for a fact that Bob Eaton and some of his staff at RR Auctions have been notified early in the last week of January in writing that this Johnson signature is NOT genuine. RR Auctions has NOT responded to any of the emails from collectors and dealers and several days later, as of Feb. 1, the item is still listed for sale. This item has 12 bids and is now at $1,433.00. The sale is over on February 10th. In the past, with the information available at the time, the signature on this card was believed to be genuine by two people; Mike Minor who owned the card and Charles Hamilton. Minor believed that of all of the similar LBJ cards that have turned up, his was the only known genuine example. Mike Minor was called by autograph expert Stephen Koschal, and Minor was told the signature of LBJ was not genuine. Koschal walked Minor letter by letter through this signature explaining in detail why he believed the signature was NOT genuine and Minor agreed. Minor stated that in an upcoming new printing of his book From The President's Pen, he would make the correction about this LBJ card. In the very popular autograph reference book, The History of Collecting Executive Mansion, White House and The White House cards Signed by the Presidents and their First Ladies by Stephen Koschal and Lynne Keyes, the authors illustrate and devote a full page to this exact card. Koschal also made front page news about this same card in the journal of the International Autograph Collectors Club and Dealers Alliance, Vol.#5, No.4, July/August 2001. Most importantly, most educated collectors and dealers are well aware the incompetency of most third party authenticating companies. Does it surprise anyone that Bob Eaton of RR Auctions and John Reznikoff of University Archives are part of the authenticating team of both PSA/DNA and JSA, James Spence Authentication? There are ten more days before this auction ends and many are watching to see if the almighty dollar trumps selling genuine autographs with this auction house.